We Work For You. One Plant At A Time. An “Agricultural Class B” designated weed is a weed of economic importance, specifically in Union County agriculture, which is both locally abundant and abundant in neighboring counties. Annual. 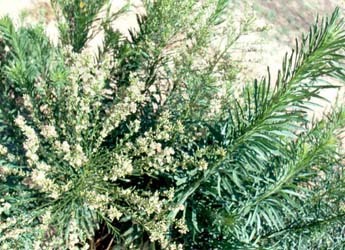 Flowers are small, white, and borne in short branches on the leaf axils. 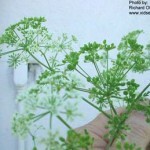 This tangled plant can grow up to 80 inches long. 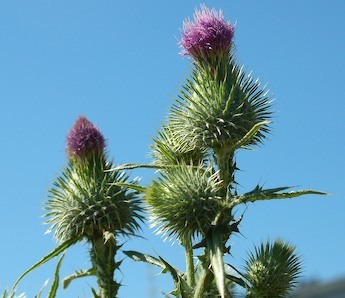 Stems are square with downward pointing bristles. It is distributed across much of the West, and is certainly a pain in Eastern Oregon’s cultivated fields particularly hay and grain. It is easily dispersed by both humans and animals due to the hooked hairs on the seeds. There are no known biological controls. Continued mowing at low heights can sometimes be effective in control. Chemical treatments can also be successful if monitored and used continually. Annual. Flowers June to November. 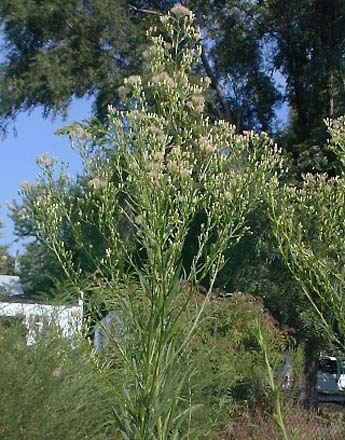 Many small, inconspicuous white flowers are produced followed by an abundance of seed. Stem is erect, often bristly, and branching. Basal leaves 1 to 4 inches long and toothed, upper leaves narrow and smooth. Height varies depending on soil conditions. 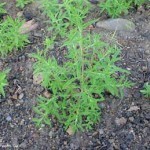 Horseweed is common in fields as well as waste places and along roadsides. 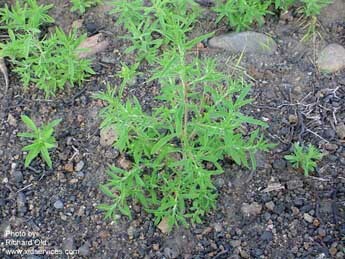 Herbicide treatments can be effective, although it has been documented that horseweed has developed a resistance to glyphosate compounds. Annual; flowers July to October. 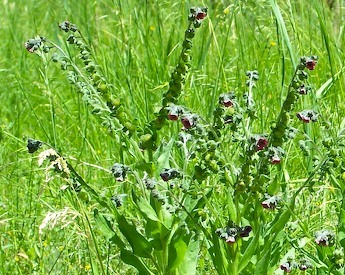 Flowers are inconspicuous spikes in the axils of the plant’s upper leaves. There are many stems which are branched, round, and often red in color. 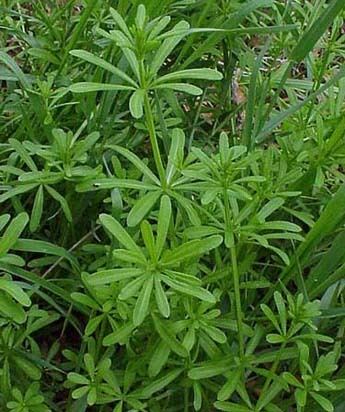 Leaves are ½ to 2 inches in length, lance shaped with hair-fringed margins. Grows anywhere from 1 to 6 feet in height. Severe infestations have been known to reduce cereal crop yields by 100%. 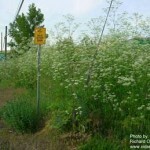 It is a problem in right of way areas, and has in the past been known to develop resistance to herbicide treatments. It is also a host for beet yellows and tobacco mosaic virus. 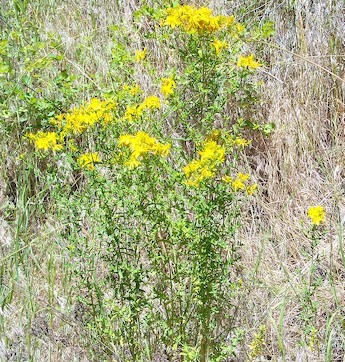 It is abundant in all counties east of the Oregon Cascades. 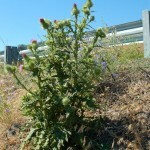 This plant is very hard to control, as it has been known to develop resistance to herbicide treatments. No biological controls are currently available. 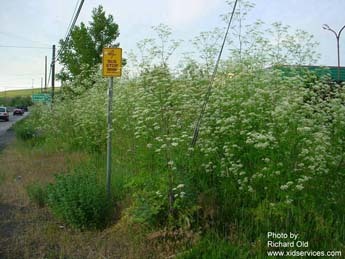 Poison hemlock grows in fields, irrigation ditches, and streams. Livestock and human deaths are attributed to this species annually. It has an abundant distribution in all counties in the state of Oregon. There are no approved biological controls. 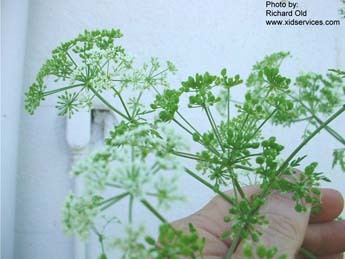 Chemical control of poison hemlock may require repeated applications to deplete the seed bank. Perennial. Flowers May to September. Flowers of spikelets are arranged in two rows flatwise to the stem. 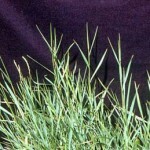 Leaf blades are ¼ to ½ inch in width and are flat, often constricted at the tip. Rhizomes are white to yellow in color, fleshy, and are able to penetrate very hard surfaces, tubers, and roots of other plants. Grow 1 to 3 feet in height. 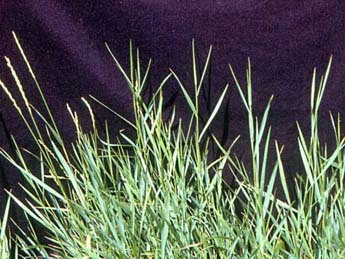 Quackgrass is often a contaminant of cultivated seed. Its rhizomes produce a chemical that can suppress the growth of other plants and therefore adversely effect the yields of cultivated crops. 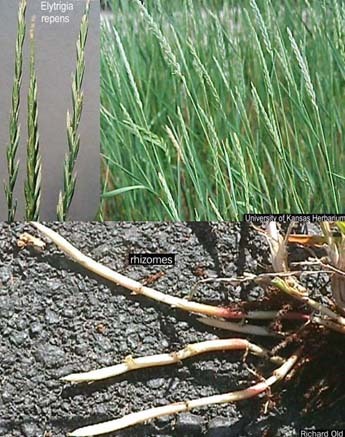 In severely infested fields, quackgrass rhizomes can weigh as much as 7 to 9 tons per acre! 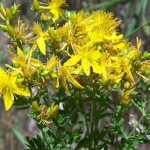 This plant is abundant in all counties in Oregon. There are no biological controls. 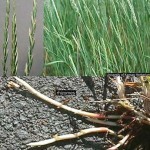 The most effective controls are repeated herbicide applications along with mechanical rhizome removal (such as tillage). Otherwise, the underground rhizomes will continue to persist and infest. Annual. 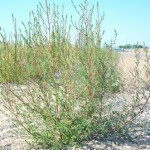 More commonly known as tumbleweed, this is a bushy, spherically shaped plant with stems ranging from 8 to 36 inches in length and reddish/purplish stripes. 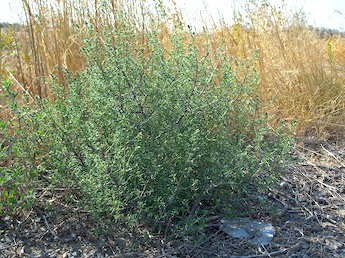 Leaves of young plants are fleshy, dark green, narrow, and approximately 1 inch in length. 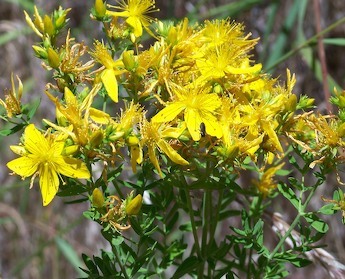 Older plants, after they mature through July to October, have inconspicuous flowers with spiny bracts. After the plant dries, it becomes brittle and breaks of at the soil level, and disperses numerous seeds as it blows across the landscape. 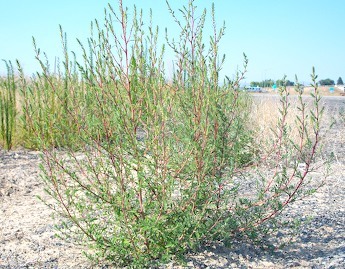 Russian thistle can reduce yields on crops and rangelands, and can also serve as host for insects, vertebrate pests, and crop diseases. It has an uncanny ability to disperse seed and can tolerant enormous drought, becoming a serious threat to agriculture and natural habitats. There are many herbicide treatments that can control both roadside and cropland invasions when targeted at immature plants. There are currently no biological controls. Biennial; flowers July to September. Dark purple flowers, 1 ½ to 2 inches wide, are clustered at the ends of branches and have seeds topped by a circle of plume-like white hairs. Leaves are hairy, prickly on the upper side and cottony underneath. Numerous spiny branches covered with green to brown hairs. Grows 2 to 5 feet in height. 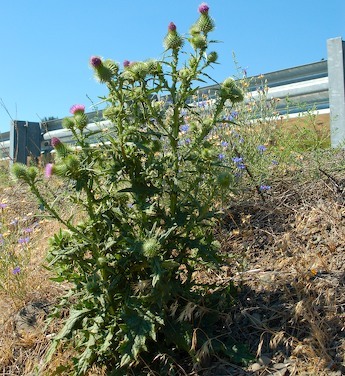 If not controlled, bull thistle can invade farmland and take the place of forbs and grasses. 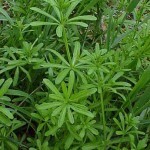 It was once thought to have medicinal and edible uses, but has since been reintroduced as a seed contaminant. It is abundant throughout the state of Oregon. A thistle stem hover fly and seed head gall fly are known biocontrols. Removing seeds is the most successful mechanical control method. Mowing or cutting closely twice per season can prevent seed production. Herbicide use can also be effective in large stands. Biennial; flowers June to August. Flowers are reddish purple and terminal, seeds are nutlets. 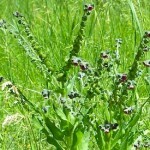 The plant forms a rosette in its 1st year, and sends up a stalk in the 2nd year. 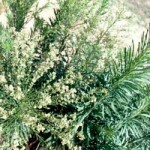 Its leaves are alternate, hairy, and can be up to 1 foot in length. 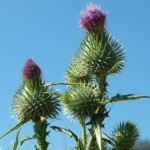 Produces a barbed seed, or burr, which will easily adhere to wool or fur. The burrs that adhere to wool can reduce the value of wool. 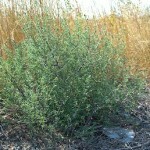 It is highly invasive and can reduce forage production in rangelands, pastures, and wooded areas. 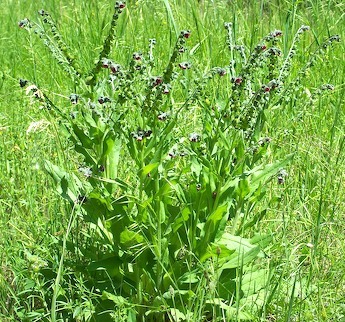 The plant also produces pyrollizidine alkaloids that cause liver cells to stop producing and can be toxic to horses and cattle. There are currently no biological controls, but research is underway with a few promising insects: a root weevil, stem weevil, seed weevil, root beetle, and a root fly. Herbicides and mechanical controls can also be effective. Perennial; flowers June to July. 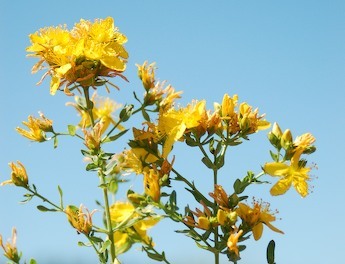 Flowers are yellow, with five petals each, with numerous stamens arranged in three groups. 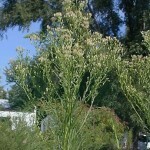 There are many erect, branched stems, with a woody base. Oblong, opposite leaves are under 1 inch in length and are covered in a number of transparent dots. Grows 1 to 3 feet in height. 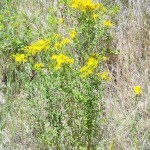 This pest invades pastures, rangelands, and timbered areas all over the west and is poisonous to livestock. Most livestock will not eat this plant unless alternative forage is scarce. The toxins cause photo-sensitivity and therefore blisters and scabs on the mouth, eyes, nose, and feet of light colored animals. Dark animals are less susceptible. 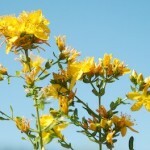 St. Johnswort can grow rapidly in disturbed, well drained sites. Four biocontrols have been successfully established in Oregon, three beetles and a moth, but only below 2,500 feet in elevation. Chemical control with herbicides can be hard to effectively administer, as the small leaves are hard to applicate and the extensive root system may not be hindered.